A couple of weeks ago I was in the woods looking for an uncommon fern ally which grew near a small pond. As I approached the pond, I saw some bright red patches through the trees. Such a sight left me wondering what it could be. I kept walking towards the pond, incorrectly figuring it must be that orange-red plastic fencing they use at construction sites. Could they be excavating by the pond? 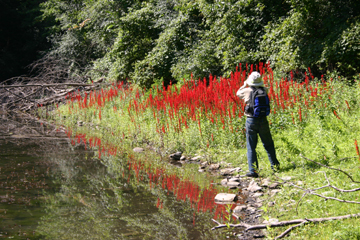 The idea made me shudder, but once I got close enough I realized I was seeing the largest colony of cardinal flower, Lobelia cardinalis, that I'd ever come across. Most descriptions of the plant that I have found list it at less than four feet tall. The one in my garden certainly fits this description, but I am amazed at the height they can reach when growing where they choose to. The tallest plant I measured in the colony in the picture above reached a height of 71" with an included raceme (flower spike) of 31". 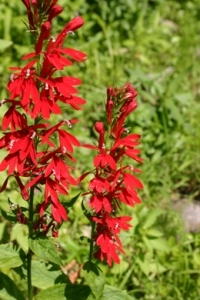 One of our most striking native perennial herbs, L. cardinalis is a member of the Bellflower family, Campanulaceae. Plants typically grow to four feet tall. 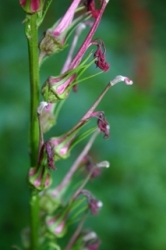 The crimson flowers appear in late summer and are 5-lobed with three lower petals and two upper petals. The flower can reach to 1.5" across and attract hummingbirds, butterflies and bees. 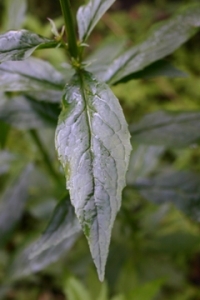 The leaves are lanceolate, to 6" long, and have a coarsely toothed margin. This plant is easily grown from seed and will thrive in a garden with moderate amounts of sun. Be sure to have plenty of organic matter in the soil, however, for the plant does not like to dry out. 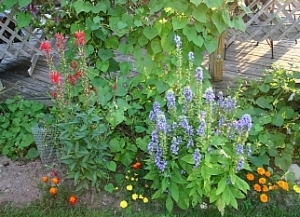 I grew plants of both L. cardinalis and another native and close relative, the great blue lobelia (L. siphilitica) from seeds obtained at our organization's "Winter Solstice Celebration" held each December. As the picture below shows, both are thriving. Although we do not have any white native lobelias, white cultivars are available from nurseries.